Four months ago, I tested a new (to me) recipe for Peanut Butter Cookies and found them to be cakey, bland, and not well received by my coworkers. In that article, I alluded to "my normal recipe" but did not elaborate on what that recipe was. Well, here's how I make Peanut Butter Cookies. 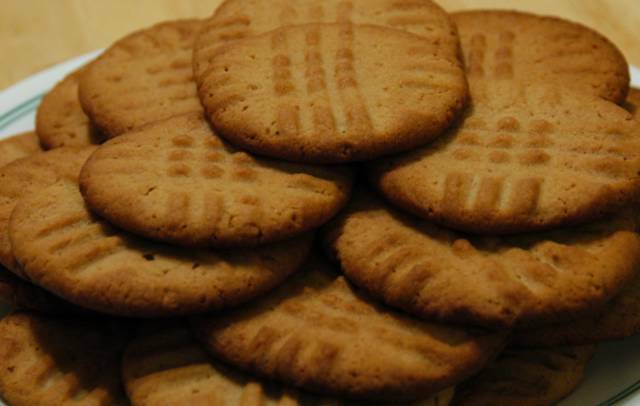 The ingredients are very similar to the Joy of Cooking recipe, but the proportions are quite different with more sugar and more peanut butter. 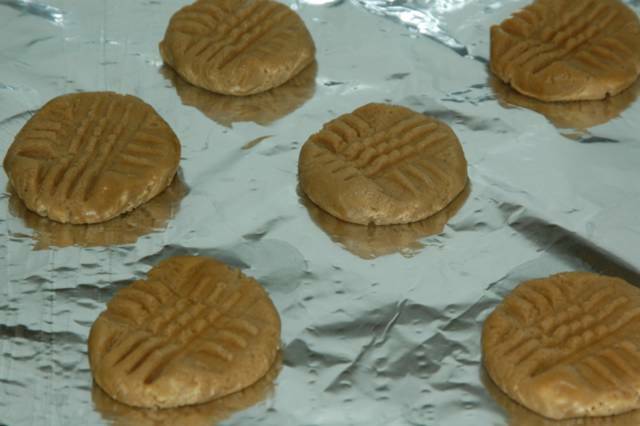 To make about two dozen cookies, start with 1/2 cup peanut butter and 1/2 cup unsalted butter. This time around I chose to use Skippy brand peanut butter. There is some concern that commercial peanut butters contain trans fatty acids since partially hydrogenated vegetable oils are used to stabilize the butter (preventing separation). On the other hand, it is common to find higher levels of aflatoxins in old fashioned peanut butter leading to a higher risk of liver cancer (if consumed regularly). According to both Skippy's nutrition FAQ and the USDA claim that there are no measurable amounts of trans fats present in commercial peanut butter. Skippy explains that the vegetable oils are almost completely fully hydrogenated (which as you remember from the Saturated Fats article cannot be trans fats since fully hydrogenated fats are chemically the same as saturated fats). Sift 1-1/4 cup all purpose flour, 1/2 tsp. baking soda, and 1/4 tsp. salt together. 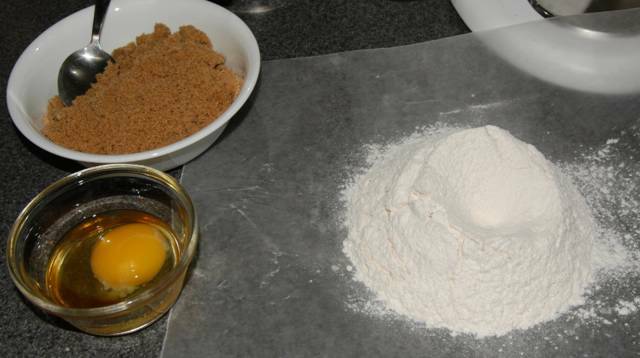 The remaining ingredients are 1/2 cup granulated sugar, 1/2 cup light brown sugar, , and 1 egg. 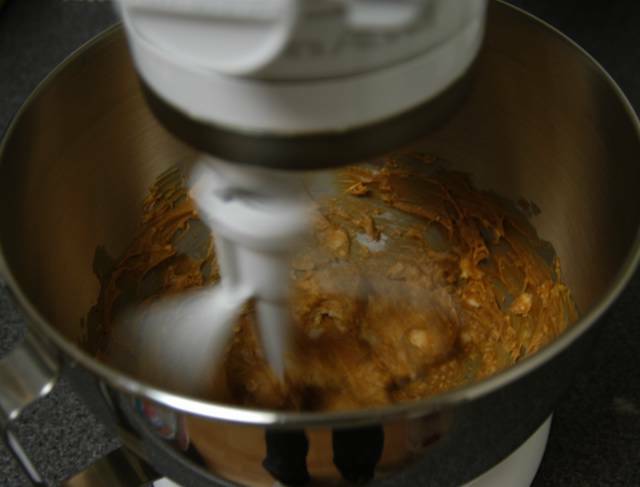 Using a stand mixer, hand mixer, or arms of steel, mix the peanut butter and butter together until relatively smooth. Don't worry about any small lumps of butter that might persist, when we mix in the sugar, the sugar crystals will perforate the butter until it's smooth. 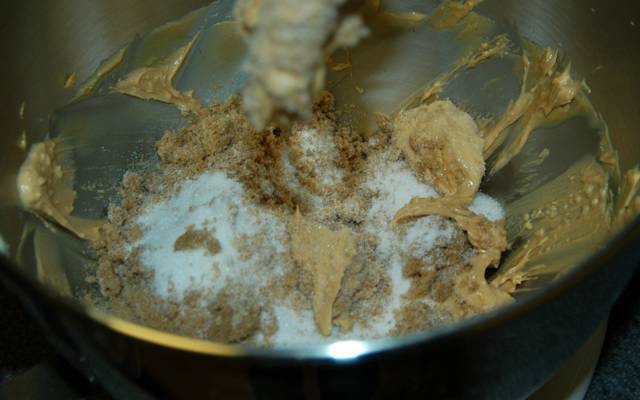 Scrape the bowl down and mix both the granulated sugar and brown sugar into the butter. Mix until smooth. Add the egg to the mixture and mix until integrated. 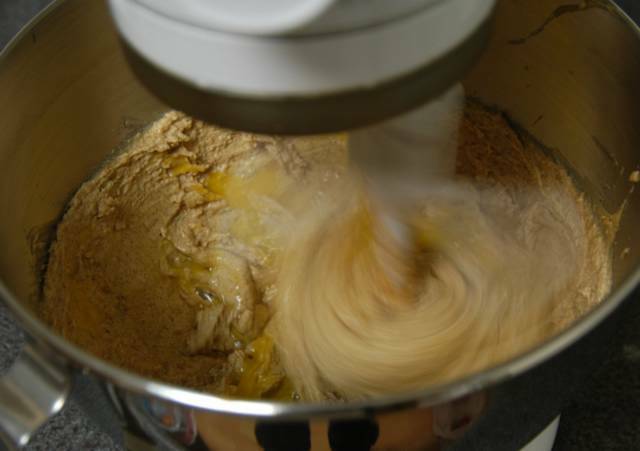 Once the egg has been mixed in, slowly add the flour as you stir (use the lowest setting on your mixer). I control the flow of flour by sifting the flour onto wax paper (or parchment paper) and folding it over so I can pour easily. By pouring the flour slowly, you won't overwhelm the batter and the flour will properly mix into the batter to form the final dough. At this point, the dough should be double wrapped in plastic and refrigerated for an hour. The dough can keep in the refrigerator for a couple days or stored in the freezer for a month. I decided to make this batch immediately (without chilling). This will create a thinner, crisper cookie (because the warm dough will spread quickly). Form the dough into about two dozen 1 inch balls. I do this by picking up a lump of dough, rolling it between my hands, and finishing up by tossing the ball lightly between my hands. Place the balls of dough onto a greased or lined cookie sheet. In the pictures below, I lined the cookie sheet with aluminum foil (parchment paper works well also). Flatten each of the balls with a fork. Place one cookie sheet at a time in the center rack of an oven preheated to 375°F. Bake for nine minutes and remove. Let stand on cookie sheet for one minute, then transfer to cooling racks to cool. 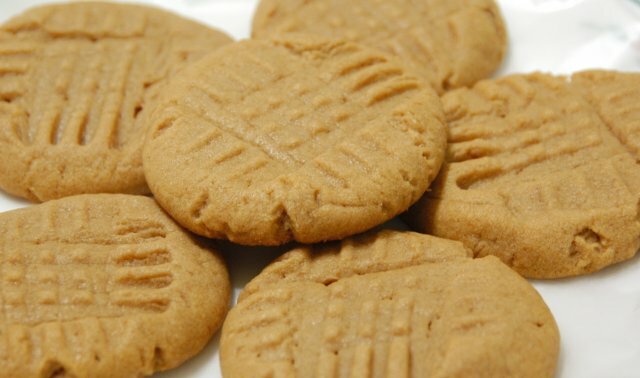 These peanut butter cookies come out golden brown with a light crispiness that melts in your mouth. 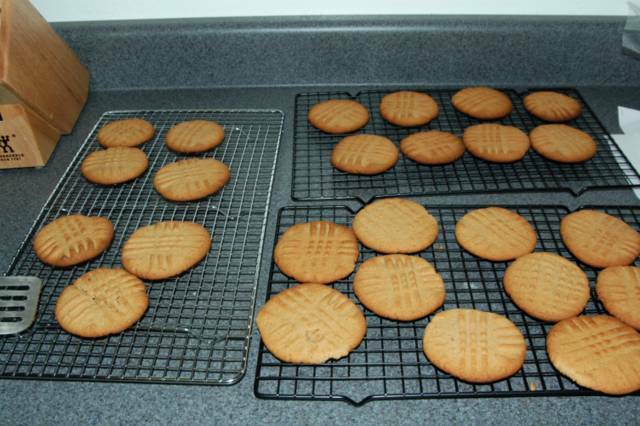 For a soft and chewy peanut butter cookie, make sure you refrigerate the dough first. Then form dough balls and press down with a fork as before. Then, simply refrigerate the uncooked cookies for at least fifteen minutes to firm it back up. Then with the oven preheated to 300°F, slide one tray in at a time for a baking time of 15 minutes. The reason this trick works is that the butter in the dough is not as fluid when cold. Warm dough will spread out more during the first few minutes of cooking, resulting in a thinner, crispier cookie. Starting the cookie sheet and dough cold, reduces the spread, making thicker cookies. The lower oven temperature keeps the outside of the cookie from getting too crunchy before the inside of the thicker cookie finishes cooking. It should be noted that if you want to make soft cookies of the same diameter as the crispy cookies, you'll need to use a little more dough in each so the spread ends up the same. 1 batch cookie dough form 1 in. balls flatten with fork bake 375°F 9 min. 1 batch cookie dough form 1.1 in. balls flatten with fork bake 300°F 15 min. Man, what I wouldn't do for some real peanut butter. Japan doesn't believe in the stuff, it seems. You can get Peanut Cream, but ti is beyond horrible. I have to admit I hadn't given your site a good look until today, and I am amazed! Your receipt format is so simple and obvious that even I can effortlessly understand it (and that is saying something). Keep up the good work. Signe and I think of you and Tina often. If you are going to be so precise as to use grams for the measurement of the goods, then why do you use inches to tell us the size to make the cookie dough balls? The use of grams is not so much for precision as to provide readers from outside of the United States an ability to cook th recipes. A lot of kitchens don't have dry measuring cups, so I do the conversions now. Using inches is not imprecise, it's just not metric and I apologize for forgetting to convert inches to cm for people who are not familiar with U.S. units. I'm making a batch right now, thanks for the metrics. Doesn't Costco Japan sell peanut butter? Next time someone makes a Costco run, you can bribe them in bringing back some. That is a good point about Costco Japan. I forgot about The Flying Pig, they will buy stuff from Costco and send it to you where you live in Japan. Thanks for reminding me! This is great! Have you thought about writing a book? The way you have laid out your recipes is exactly how my husband would need to see it to conceptualize a recipe. wat kind of peanut butter are u using? chunky or smooth? Does it even matter? I used creamy peanut butter. If you like little bits of peanuts in your cookies, then use chunky. Both work well. Hi, this looks good. I'm a vegetarian though. I'd appreciate some comments on my blog too. God bless! I'm glad to see someone understanding the reason to use grams. And I'm also glad that you dont see the need to use the very ridiculous imperial measurements system more than necessary. I recently made cookies for the first time and used this recipe; the cookies are great. The main error I made was adding the ingredients in a different order; your descriptions of why the sugar is added first helped me appreciate the importance of order. When I added them in the recommended order, it went more smoothly. Out of three batches, I used half the butter for the last two and didn't notice much difference in the taste. 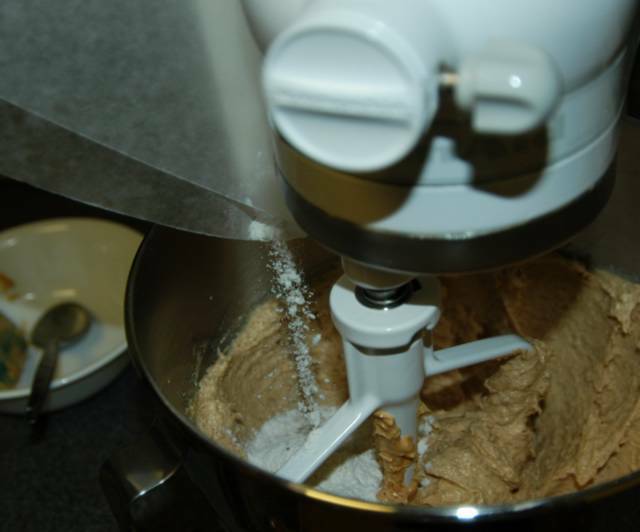 Also, a mixer was an overkill since there is so little dough (when I tried I got bits of dough all over the kitchen). A mixing spoon worked much better and didn't tire my hand much. I plan on making some oatmeal cookies next, then branching out to muffins and bread! In your recipe you say you use more peanut butter than the Joy of Cooking recipe. But you call for a 1/2 cup of pb and Joy of Cooking calls for 1 cup (I have the 1960s edition, maybe you have a newer revised one?) Please advise! Proportionally, this recipe uses more sugar and peanut butter than the Joy of Cooking. The Joy of Cooking recipe yields two batches of cookies, while this recipe is for one batch. 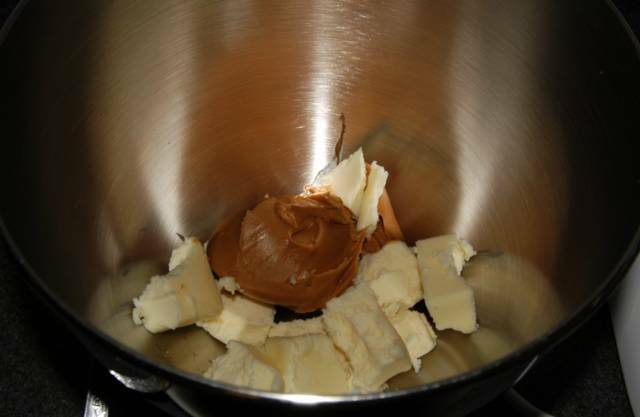 My edition of joy of cooking calls for 2/3 cup peanut butter resulting in 1/3 cup per batch. Starting with 1 cup peanut butter as your edition recommends, would result in the same 1/2 cup of peanut butter.